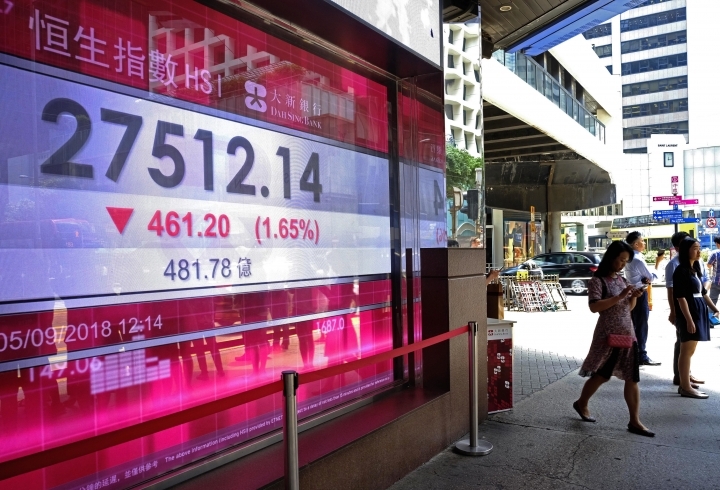 LONDON — Global stock markets fell Wednesday as trade tensions resurfaced ahead of more talks between the United States and Canada on revamping the North American Free Trade Agreement. KEEPING SCORE: In Europe, France's CAC 40 fell 0.9 percent to 5,294 while Germany's DAX lost 0.6 percent to 12,110. London's FTSE 100 shed 0.5 percent to 7,420. U.S. stocks were poised for modest losses at the open with Dow futures and the broader S&P 500 futures 0.3 percent lower. TRADE TENSIONS: The United States is due to resume talks with Canada on changing the North American Free Trade Agreement. There is also speculation that President Donald Trump may also announce new tariffs on $200 billion of Chinese goods as early as this week. ANALYST TAKE: "As we head into the business end of the week, markets are trading with a slightly negative tone as traders turn their attention back to NAFTA talks and a potential announcement on Chinese tariffs," said Craig Erlam, senior market analyst at OANDA. "Trump may have been aiming to get NAFTA over the line ahead of the midterms but I think he's in this one for the long-run and the Chinese don't appear to be in any mood to back down, even if they aren't able to respond with the same volume of tariffs." AMAZON: The online retailer will also be in focus, a day after it became the third publicly traded company and the second in the United States to reach $1 trillion in market value following Apple Inc. Amazon has risen from an online bookseller to a behemoth that sells toilet paper, TVs and a wide range of other goods. It is expanding into health care, advertising and cloud computing. The net worth of its founder, Jeff Bezos, has risen to $160 billion. The Chinese oil company PetroChina Ltd. temporarily had a stock market value of $1 trillion in 2007 but has fallen sharply since then. 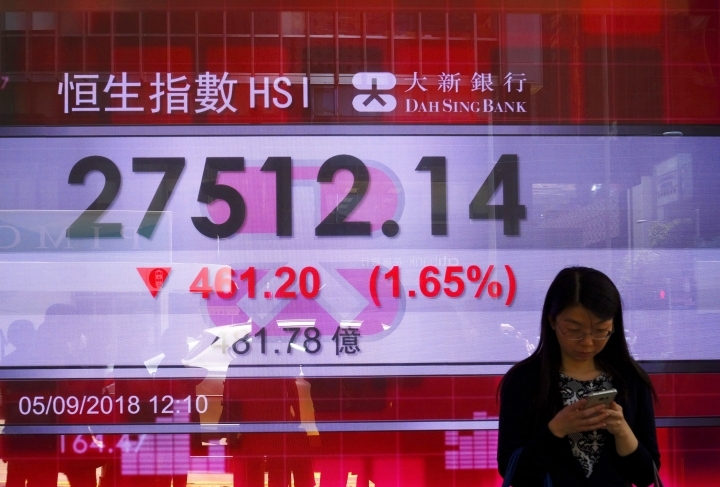 ASIA'S DAY: The Shanghai Composite Index lost 1.7 percent to 2,704.34 and Tokyo's Nikkei 225 retreated 0.5 percent to 22,580.83. 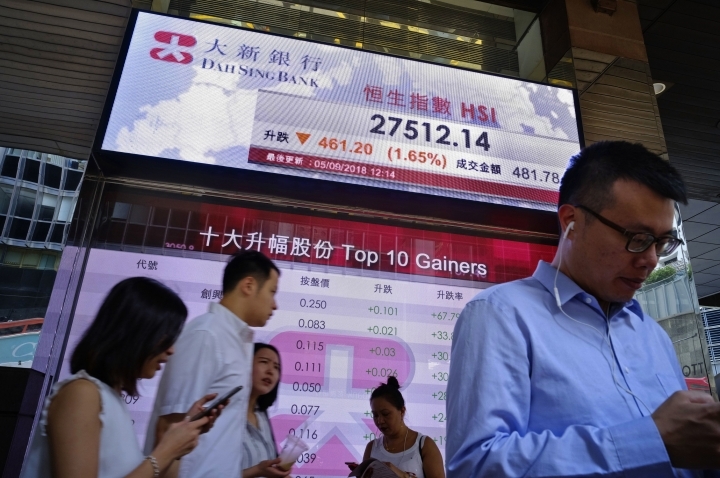 Hong Kong's Hang Seng dropped 2.6 percent to 27,243.85 and Seoul's Kospi declined 1 percent to 2,291.77. ENERGY: Benchmark U.S. crude declined 76 cents to $69.11 per barrel in electronic trading on the New York Mercantile Exchange while Brent crude, used to price international oils, shed 64 cents to $77.51 per barrel in London. It gained 2 cents the previous session to $78.17. CURRENCY: The euro was steady at $1.1583 while the dollar rose 0.1 percent to 111.57 yen.